Offering a peaceful and private lifestyle, this beautiful 10 acre property has a comfortable home, substantial sheds, perfect northerly aspect with long uninterrupted views. A lovely long entry finds the split level home with relaxing full length verandah to really sit back and enjoy those views. The main living level has soaring ceilings throughout adding to the spacious feel and filling the home with natural light. A carpeted lounge area is air conditioned and features a wood combustion stove plus built in shelves for displaying those precious trinkets. The central kitchen was remodelled only a couple of years ago and now has new electric appliances, tiled marble look bench top, and walk in pantry. Walk through to the dining area and large laundry/wet room with third toilet. Upstairs on the mezzanine level are the three bedrooms, all with ceiling fans, and good size bathrooms. The large main bedroom is air conditioned with a walk in robe and modern ensuite boasting twin basins. The sheds here are in a word fantastic! Firstly, there's a 5 bay wide shed that is 9m deep, has 3 roller doors, power and lights and a shower and toilet inside. A double carport is sited in front of these doors providing either more covered car accommodation or protection from the elements when the doors are up. Adjoining this is another 7m x 10m open machinery shed with extra height, ideal for horse floats, boats or caravans. The gentle fertile land is mostly cleared and fully fenced. Currently running cows, the land would suit horses or any rural pursuit. Plenty of water from the spring fed dam that is irrigated to the outside taps. 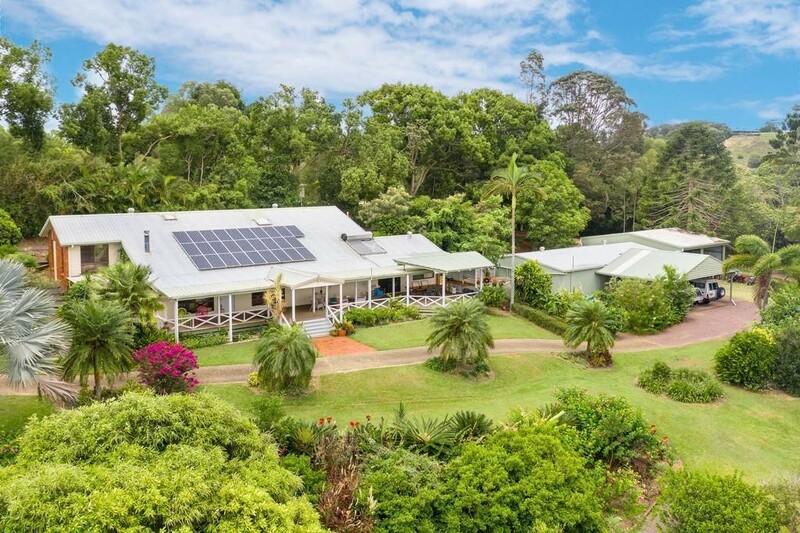 Just a short drive into thriving Cooroy in the Noosa hinterland, this property has a country atmosphere with a very convenient location. Please call or email to arrange your private inspection.